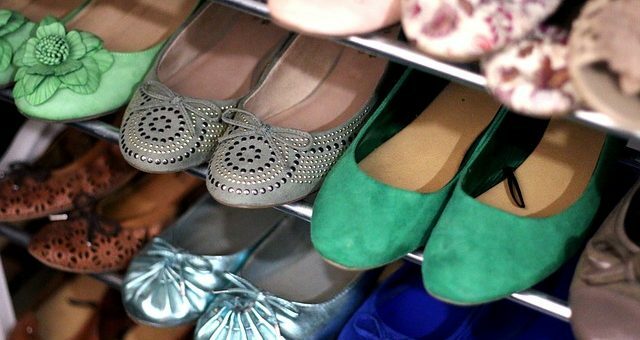 Each and every one of us owns a variety of shoes and footwear, all for different occasions, some of us own more than others. Therefore a Good Quality, suitable and spacious Shoe Cabinet can become an integral piece of furniture in your home. 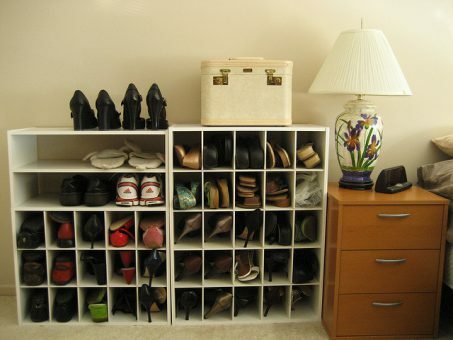 A shoe Cabinet has the main purpose of keeping your shoes organized and easily on display. There are so many different varieties of shoe Cabinets available, some have an open structure, to display shoes and others can be closed, so that they are hidden for your eyes only. A shoe Cabinet is a highly Functional piece of furniture to organize and stores your shoes in, keeping them clean and preventing damage. It is also a decorative piece that can display your shoes, or hide them neatly in a gorgeous piece of furniture. You can place a shoe Cabinet at the entrance of your home, so you can easily change from outdoor shoes to indoor shoes, and open or closed design in a neat wood or steel will work perfectly in this regard. A plastic or fabric type shoe Cabinet can be placed inside a closet or dressing room, or even neatly in a small room to keep your shoes organized and save on space. You can use a decorative and well designed Wooden shoe cabinet that closes to store your shoes in, in your bedroom, living room, or home entrance, as a visually interesting, and similarly functional piece of furniture. There are so many different types, shapes, sizes and materials of construction when it comes to shoe cabinets. Materials such as <strong, Wood, Fabric, Vinyl, Glass, Metal, and even Plastic can be used to create a shoe cabinet. In the end it will depend on where you are going to place your shoe cabinet, the size and shape that you require, as well as if you need it to look decorative, or if it is only functional. For a shoe cabinet on the outside I would recommend wood or a metal that is well finished of and appealing to the eye, you can choose between an open display design, or closed, hidden design. If you are looking for a shoe cabinet to place inside a storage or dressing room, or even in a closet, then plastic or fabric would be ideal. Some fabric Shoe Cabinets will look equally good in a bedroom setting. I would advise, when you have chosen your type and model of shoe Cabinet, that you make sure whatever it is made of, that it is well constructed and good quality. We start off with this large and exquisite piece of furniture from Baxton Studio, the Eloise. A spacious and versatile Shoe Cabinet with open shelves, and two-door closed shelve option, that is perfect for storing shoes, and other items neatly, in any area of your home. Manufactured from high-quality Beach Wood with a stunning Walnut color finish. A Large Modern Contemporary styled Shoe Cabinet with Two Doors and open shelving. The doors are slatted for better ventilation and decorative details. The doors likewise open easily because of the grooves and Magnetic closing mechanism so they stay closed. There is enough storage room for 18 pairs of shoes in the closable shelving, as well as additional storage space for a further six shoe pairs in the open shelving. Here is something a bit more modern and simplistic for the avid shoe collector. A fabulous white wooden Cabinet and Organizer that has closable shelves, each with a mirror on the back. Modern styled with a special Mirror design and décor for your home. Space-saving pull-down drawers design that opens and closes very easily. A full-length mirror when all the shelves are closed, featuring five glass mirror doors so you can easily view your complete outfit. There is ample storage space for at least 10-20 pairs of shoes in the five rotating drawer system. Enough space for shoes up to a size thirteen. Sturdy and durable construction with quality MDF boarding and a wall mount design. You can create your own stylish and durable shoe Cabinet with these nifty stackable Shoe Racks, that can create a stylish Modular Cabinet. These Plastic Shoe Storage Organizer Units, each has a functional unit, and is very easy to clean and maintain. Comes in a set of 24 Stackable Units each with a door. This unit is the ideal storage solution if you have a narrow and limited space available. Two or more sets will allow you to assemble cubes together in any shape you wish, and with the additional rubber mallet you can easily assemble the set by yourself. 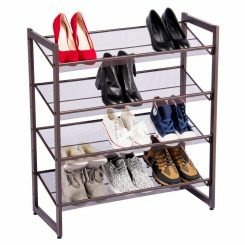 The six-tier organizing shelf can store up to 12 pairs of men and women’s shoes in general sizes. Very versatile you can likewise use this cabinet to store other items such as clothing, toys, office supplies or even use it as a DIY playpen for your pet. Looks great in your bedroom or living room area, and can be placed inside a closet. A simple, elegant, and open design, the Topeakmart 4 Tier shoe cabinet offers ample space to store your shoes, and an easy to clean design that will fit in any closet or small space. Manufactured from iron with a baking varnish in a copper tone. You can install the shelves easily in either complete horizontal position or a more incline position, which ever you prefer. The sleek and stoving varnish finish protects the rack from water, rust, and corrosion, for long lasting durability. The mesh metal design allows you to easily store wet shoes, and this, in turn, could make an ideal drying rack for your shoes after washing them. This type of rack similarly allows you to place a large variety of shoe types and sizes. I simply love the design of the Homebi 10-Tier Shoe cabinet, it is so versatile and portable, you can use it anywhere, as well as take it along with you when traveling for storage. Portable and very convenient to use and assemble for traveling purposes. Multi-Functional with ample storage space for all kinds, shapes, and sizes of shoes, as well as for many other objects. A space saving tower design that can be placed anywhere. Manufactured from durable dust proof fabric, that has a zipper closable flap that can be rolled up to view your shoes. The Orolay Bench Shoe Cabinet is small, compact and versatile, It is available in both white and natural wood finishes, with a cushioned seat, for use as a small chair, ottoman and Shoe cabinet alike. Manufactured from MDF and Bamboo wood with a Polyester Linen fabric seat filled with soft sponge. Durable and long-lasting, solid wood construction, with a firm cushion seat that will not deform with time. There is two pull out drawers for storing your shoes. The compact rectangular form of this piece of furniture easily places it in a number of small areas in your home, not to mention the exquisite style and finishing. Very simple assembly and comes with complete instructions.